Jambeaux, everyone!!! Harambe! 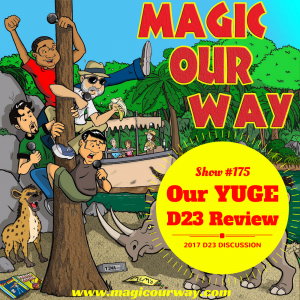 On this episode, we talk about everything that was confirmed from the the 2017 D23 Expo this past weekend. It is our best discussion yet. It is going to be YUGE! On today’s show, we have Danny, Eli of www.ivorycomics.com and Lee of magicalmomentsvacations.com. Also, we bring back Peter. You may friend remember Peter from MOW #141. 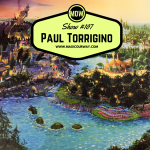 We are happy to have him return and geek out about all things Disney. In the Hub, we discuss everything that was released in the Parks and Resorts Presentation of the 2017 D23 Expo. If you are a Disney fan, there is no doubt that you have seen the announcements that have been flying all throughout social media. D23 is “The Official Disney Fan Club” of the Walt Disney Company. The D23 Expo occurs bi-yearly. Fan sites have released umerous announcements declaring the news is breaking and confirmed. But, the D23 Expo is the definitive place to receive the official word from the Disney company about what is going on. What did you think about our discussion? Did you agree or disagree with what we said on this show? Do you have any strong feelings regarding any of the D23 annoucements? Any comments? Share them at show@magicourway.com. Your opinions are always welcome on our show.